Maasi Saba – MAASI IS TRYING! Its that time of year where we are lurking around the corner to see who has the best lawn suit, unstitched or stitched. Pakistan has come a long way in the retail business. So many different brands, so many different colors, but, they seem to be all copying each other. I love the digital prints, but everyones designs seem to be blending together. They almost all look the same. Then you have the “zoo” obsession as one of my close friends from New York stated a few days ago in our whatsapp chat. I like many others, prefer not to wear anything with eyes on it. 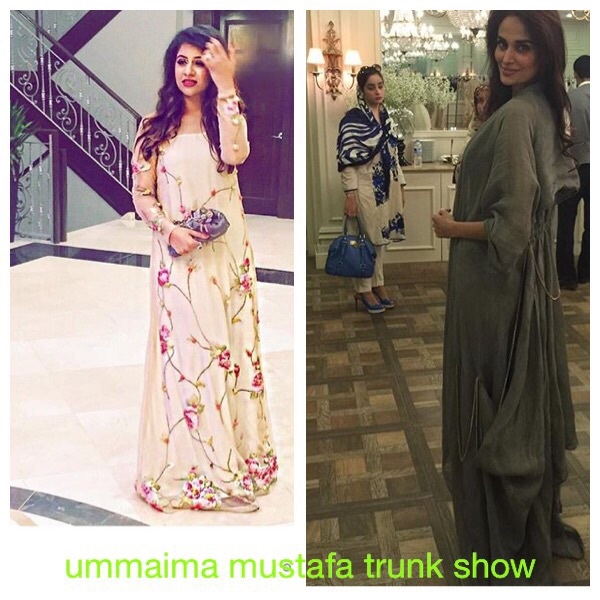 Some of the kurtas look amazing. I’ve almost stopped breathing because I’m so excited to have found an amazing kurta, when low and behold, my eyes start to focus again, and there butterflies, flamingos, oriental people, parrots, birds, beetles, etc on it. Then I put it back with a heavy heart because I won’t wear anything that won’t allow me to pray wearing it. That means, “NO FACES PEOPLE!! !” They are everywhere! One has to be very careful in thoroughly searching the ENTIRE kurta/loose material, because you may not see it at first, but more than 75% of the time, SOMETHING IS LOOKING BACK AT YOU! I feel its best to bring someone along, since at first glance you over look it and get excited. You need someone to burst that bubble and bring you back to reality. My post this week is about the lawn exhibitions. The private launches, the pre-launches. I feel depressed about this whole trend that seems to have caught on to every designer/textile house. When did it become okay to make us women act like animals grabbing suits like there was no tomorrow? When did it become okay to make us crazy with anticipation on getting to the shop early so we could run in and take hold of an outfit that we will happily wear only 1 season. What happened to printing out suits for the masses. We all wore them. Gul Ahmed, Al-Karam! They printed a design, sometimes in a few colours. One would be able go to Saleem Fabrics and decide which color and bring it home to shrink it and decide on how to get it stitched. You see, back then, we could have had the same design, but we always got it stitched differently. We were unique. Now, the designs are printed once in bulk, laces, and millions of pieces are sold with it, but there is a catch. If you want to look amazing, you will have to put all those pieces together to copy the picture on the packet. We all look like copies of one another. Where is the fun in that. To top that off, they are costing a ridiculously steep price. Most women in Pakistan won’t be caught dead wearing it the following spring/summer season. It usually ends up going to the maid or worn when doing household chores that make you sweat. I wish the designers would stop making us look like fools. They say we do it to ourselves. Yes, we do. But we are not only to blame. Everyone wants a nice outfit, everyone wants something different. The long lines at pre-launches is embarrassing. The salesmen won’t even show you the booklet until it’s your turn to buy. If you are going to the launch, most of the designers, friends of designers, bloggers, fashionistas and magazine reporters all are wearing their outfits of choice. While the rest are waiting in line to get their fingers on one as well. I wish they would stop making us feel like if we don’t have that particular designer’s lawn outfit our wardrobe is not complete for the season. Abroad, its only couture which is not mass produced, which people hardly buy everyday. People are civilized when they are shopping for the new season. But here, it’s a different story. Maybe it’s time we stopped this trend ourselves. After six years, my dua was finally answered when I became pregnant with my fourth child. I was so happy because I had always wanted four kids. It’s just a nice round number. I prayed all through out my pregnancy for the baby to be a girl. I wanted 2 and 2. And alhumdulilah again, my dua was answered. When I actually had my baby girl, I was sort of in a daze. I remember the ward being overly crowded because many women were there for several reasons, and there were renovations being done at the hospital. My kids were having their midterms, and i remember dropping them off and then driving to the hospital. It was December, and the weather was bringing me down. It was the first time I felt any sort of depression after giving birth. My siblings were arriving for our youngest brother’s wedding. All of our kids were having a ball chasing each other around the house, which I think helped me to not sink further into a depressing mood. I even went out of the way and called up my brother saying, I am overwhelmed with the baby, the weather, and getting the kids ready for their exams to come to your wedding. I wanted to relax during those days since the exams would be done. Lol! He thought i was insane. I did manage to get to his wedding which was here Lahore. I got their late. Made a sloppy entrance and was dazed meeting everyone and handing my child over to relatives who wanted to see her. Since I was the groom’s sister, I was supposed to be needed elsewhere. I showed my face, and then I left early with my kids because I still had to pack our suitcases because I was supposed to be following the Barat out of the city. Well, my dear Chachu (Uncle), came to my house in his empty car and had to wait a little while longer because my little one had leaked, and my other kids were running around excited to be going to Nana’s house for a few days. I think the rest of the wedding is a blur. I was there physically. I wish I was in better health and state of mind, but oh well. It wasn’t my wedding, so it’s okay. Whenever my brother says anything to me I always remind him that I was there!!!!! It should be enough. Fast forward and it is three years later and my little darling is learning a lot of english, (courtesy of her cousin from Pennsylvania). She has responses for everything! And sometimes I’m just amazed because my other three kids weren’t this vocal and confident. I guess, daayr ayee daroost ayee. Or something like that. She is one of those kids who knows everything about our cell phones and ipads. I seriously didn’t know about a few things but this one likes to press everything and open everything and voila, she has discovered something else. She is also one of those selfie addicts as well. Or, hmm, I’m not sure if it qualifies as selfies. I have put a lock on my phone because a few times in the past, she had called some of my friends and siblings overseas at odd times and finished my balance. Then she also likes to delete apps and pictures I don’t want her to do. And who can forget the many times she has disabled my phone. Sometimes she makes me frustrated. But then she tells me that she was just trying to see something or she was trying to do something to help me, and then I can’t stay mad long. She is my baby after all. One of her favorite past times other than going through her siblings’ drawers for some treasure, is to take pictures. Sometimes when I finally get my hands on my phone, I have about 40 pictures. Some are bursts of 14, or even 30 pictures of absolutely nothing. Sometimes its half of her head, or the fan above her head, or its her feet, or the walls or the floor. There are just so many pictures that she is amazed at her talent. My little doll knows how to change the tone and the style of her pictures so usually they aren’t so boring. These days, when she sees that the camera app is open, she asks if we need to smile quickly. I wanted to share some pictures she took the other day. In one, she cut my head off, which was very considerate of her since she should know I hate having my pictures taken. She did ask me to smile, which I did, but hey, she is too smart to bother me with cropping my head off. The next is the classic pic of her socks and shoes. She loves taking pictures of her bed, my bed and the walls. She’s an amateur photographer. It made me smile at how amazing life is when you have a toddler to share it with. My adorable baby girl, is no longer a baby, but she is my youngest, kissable, and huggable being. I have those off days when she tires me out, but alhumdulillah, the good outweigh the bad. And even now, when I stop occasionally to think about what to write next, she insists I type the ABC’S quickly as possible. For those who have kids, we have all been told to sit back and enjoy them. To take each moment with them and cherish them because soon they will be too old to sit with us. It’s amazing how some people do exactly that. But I am not one of those people. Well not yet. I’m not sure if I ever will be. I would love to be one of those people. But I am not sure I’m built that way. But I am trying. So I must end this because she wants to watch her mickey mouse show right now. Even though she should be asleep at this moment, she is resting her head on my arm and waiting impatiently for me to stop my work and put her show on. So enjoy her pictures. I hope they put a smile on your face like they did on mine. Kids are kids! May Allah SWT guide them to be good muslims, and protect them from all harm. The other day I was waiting for my turn at the books shop in Gulberg when something disturbing happened. It didn’t happen to me personally, but it has an affect on me. Thinking about it now, I am disappointed with myself for not voicing my opinion on the matter when the incident occurred. Rudeness and arrogance is very common in our society. Our beloved Prophet (S) had stated to remain humble in our dealings and in our behavior, and that arrogance would just lead to life in misery in the here after. As a mother, I felt humiliated because this is something we have to teach our children daily. It was a slap in the face that maybe we aren’t doing a good job as we had thought. My sons go to an esteemed school and they have picked up some bad habits. When they show this arrogance, I reprimand them on the spot. I also make it a point to remind them what they did was wrong a few more times, hopefully it will sit in their heads for future reference. This girl must have been 16 years old, give or take a year. She was waiting at the counter for the salesman to attend to her. It is true that I wasn’t there when the girl arrived. And I have no clue how long she had been waiting for someone to assist her. It was chaos at the bookshop as many adults and children were trying to get their school supplies. These last few weeks are crazy everywhere, if not in bookshops or uniform shops, it’s on the roads in front and around these places. Usually we are in a bad mood, or short tempered because of the chaos. Yes it is annoying to have to wait for someone to help you. But everyone else there is in the same boat as you. So give some leeway. So as I was saying, this girl was waiting at the counter, and I was standing behind the woman who was being helped by the salesman. When he finally gave the lady her bill and freed himself from serving her, he turned to the girl. He knew who was to be served next. I moved up to the counter with my slip. She spoke very rudely to this man who must have been her father’s age. She said that she had been waiting for a long time and he wasn’t helping her. He kindly stated that he had to finish with the other customer and give her the bill before he could help someone else. She looked at him and rudely said, “Whatever!” I just looked at her gaping. The salesman looked at her and was hurt and after a little while his mood turned bitter. But yet, he still was kind and helped her. My mind started to wonder at thoughts that really shook me up. I will tell you honestly, that if it that was my child and he/she responded in that manner, I’d just smack them upside the head, and scold them repeatedly. “You can’t be rude to him. Who told you you could be rude to anyone let alone your elder? !” These are the things that would have come out of my mouth at the given time. I realize the lifestyle in Pakistan is different than what I was accustomed to growing up with. In the U.S., you don’t have servants waiting on you at all times, unless you are rich. If one can, a cleaner comes in once or twice a week and does your cleaning. The rest is up to you. Here, we have help for every chore, and for everyday of the week. People come in to clean our houses, do our laundry, cook for us, and help watch our children. We can hire gardeners, drivers and guards. Someone is always there to clean whatever dishes we just dirtied, or pick up the clothes we have thrown on the floor. Most people take advantage of these people. They are after all people. I feel some of us have taught our children to talk down to the help. That includes salesmen and women. I have heard children talk rudely to their drivers and maids, and when they are in the shops, they are quite rude there too. I personally don’t like this behavior. We are all equal, and we all should treat each other with respect. I don’t allow my children to talk disrespectfully to any of our servants. They always get a scolding from me if I hear them doing so. But how do I stop this from happening again and again, inside or outside the home. As a nation, we need to correct this problem because it happens everywhere and all the time, I am sad to admit. Yes, there are times when I am angry or very upset with my domestic help. But most of the time, I speak to them nicely but firmly. I can actually say that I have yelled 5 times in the past 15 years to my help. That is also not good of me. Respect is earned, it is given, it is supposed to be an automatic response when dealing with anyone. 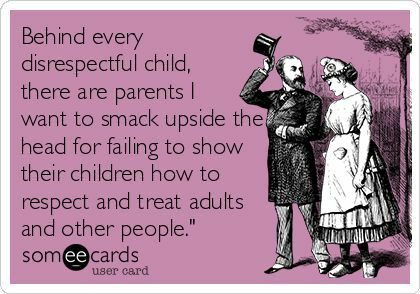 If we as adults, and as mothers, show respect to others even when it is hard because they have messed something up, or spoken rudely to us, we show this response to our children and it will make a difference. Slowly, but surely, we can make Pakistan a country people will want to live in. Everyone is usually in a bad mood here. Heat, blackouts, water shortages, and unruly traffic are some things that add to our daily hardships. So when we go out to run errands, our dyer, or the traffic police, the salesman or vendor, or just a random person on the road does something to us which makes us angry, we respond. We respond with gestures, we respond with name calling. 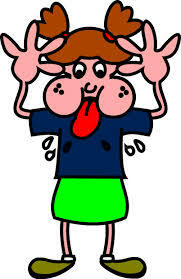 We sometimes respond but cutting them off, or beeping our horns repeatedly. We can do the worst bit by demeaning them, and that makes us feel better. Well, it shouldn’t. We should feel horrible at even thinking about this stuff. Living in this world is not easy. Being a constant role model is even harder I think. But, we need to change ourselves, can’t we? 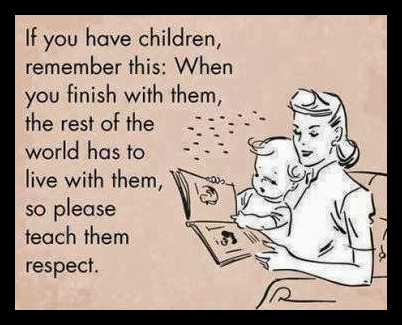 Show some respect to one another and our children will do the same. Show some leniency and our children will follow our lead. We are human, we will mess up, and we will continue to do this. Inshallah, we will not repeat our same mistakes. But respect is key. My friend Zainab is an avid reader. I think she was the one who got me to start reading again. She is always recommending books to me, and I have enjoyed each and every one. Thanks Zainab! 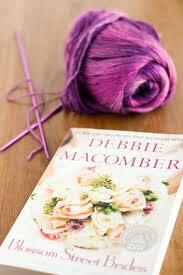 Last time we met, she recommended the author Debbie Macomber. She is a New York Times Bestselling Author and has written many novels and is a multiple award winner. The novels she recommended were from The Blossom Street Series. There are ten novels in this series from what I found on the internet. The first novel, “The Shop of Blossom Street,” is about a fictional little shop in Seattle, Washington, which is owned by a graceful and thoughtful woman named Lydia Hoffman. She owns a yarn shop, and teaches knitting to beginners. Each novel brings in new characters and some of the old characters occasionally show up and bring warmth to the story. These novels address problems that woman face everyday. Each character is at a different phase in life, and with each other’s help, they are able to resolve their issues. 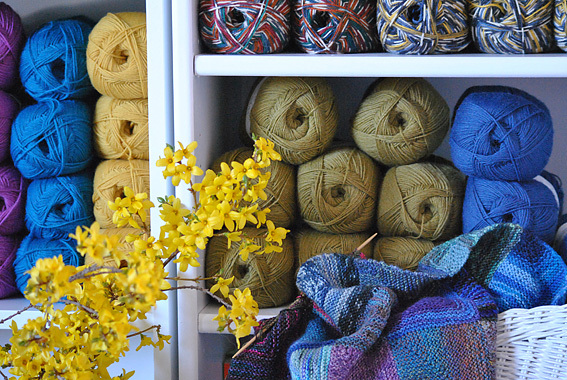 Lydia opened the yarn shop as a dedication to living everyday, especially when she has another cancer scare. Finally living on her own and living an adult healthy life, she is faced with problems about the shop and about love. In her first class, she is teaching three women who are complete opposites than one another. When these four women sit together every week to knit little did they know they would end up sharing their secrets and form a life long bond. Alix Townsend is a video store clerk who is ordered by the courts to knit the baby blanket as part of her community service. Jacqueline Donovon is a wealthy middle aged woman who takes the class to try to make amends with her daughter in law whom she hasn’t gotten off on the right foot with, but is carrying her first grandchild. And Carol Girard who is a successful business woman having infertility problems, but taking the class in good faith that it will help her to have a child. In the second novel, “A Good Yarn,” Lydia is offering a class to knit socks. This novel takes place a year after Lydia opens her shop, and we meet her sister Margaret who is also helping her with the shop. Courtney Pulanski is an overweight high school senior who is still struggling with the death of her mother four years ago. Her grandmother tries to help her settle in by making her take the knitting class and by making her swim in her senior citizen swimming sessions. Bethanne Hamlin is a recent divorcee whose children convince her to join the knitting class as a step towards starting over. Her classmates help her find her confidence and her talent that she so long ago pushed aside to support her husband. We also meet Elise Beaumont. She is a retired librarian who has lost her life savings and is living with her daughter, only to find out that her gambling ex-husband still loves her, and that she feels the same way. All these women are there for different reasons, and bring their own stories which are unique and diverse, but come together in the end making lasting friendships. This series of books, are written with the direct perspective of each character. Debbie really helps bring the reader into each life, their struggles, and their fears. I love reading these books. I am one of those readers who get’s very sad at the end because I feel I’ve lost a friend. Reading these novels makes me want to go out and buy some yarn and start knitting. But right now, I’ll put it off because it’s just too hot to hold any yard in my hands. I also don’t remember how to knit anymore. The last time I knitted was when I was in the 2nd grade, and my cousin helped me knit a sweater and a skirt for my Barbie. I think almost every novel has the pattern for that particular project included as well. In the stories, Lydia helps her customers knit socks, a baby blanket and prayer shawl. For anyone who enjoys knitting and reading, it’s the perfect match. As the series progresses, the reader really gets to know Lydia, as well as the other characters. The books offer an excellent overall story throughout and any of these books can be read on their own, separate from the rest of the series. Here is a list of the books from this series. P.S. Since books sometimes are printed with 2 titles due to different markets, make sure you read the back carefully so you don’t buy one twice. Because actually, I did that! I didn’t realize it until after I read “Wednesday’s at four,” which is also, “Back on Blossom Street.” One cost me Rs. 15 and the other newer version was much more. Serves me right for just grabbing things off the bookshelf before my kids came back. P.P.S. 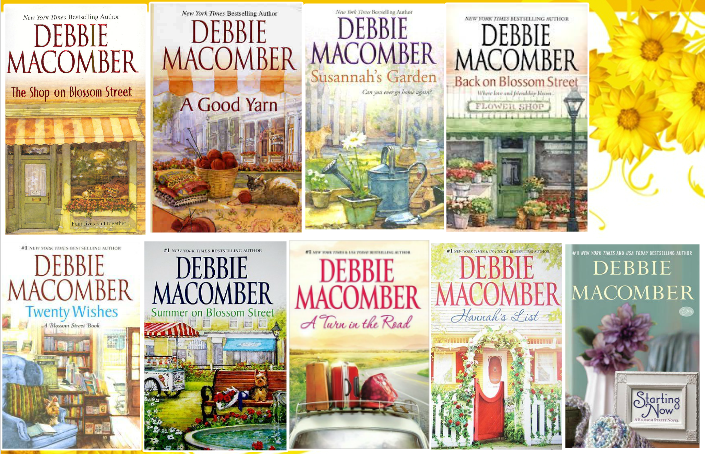 Zainab and I were were discussing a new show at the bookshop, when she told me that the show was based on books by the same author, Debbie Macomber. The show is called Cedar Cove, and produced by the Hallmark Channel. It stars Andie MacDowell and Dylan Neal and it is a nice, decent show. Check it out. It’s still quite hot here in Lahore. The temperature has lowered a bit where at times the fan is enough to cool me. Even though schools have reopened this week and inshallah I will get back to my old routine, I’m still a lazy bum. And a bum just wants to eat. To eat something cold, and ready to eat is more my style these days. So, I wanted to share with you all a recipe for a salad my mom makes. Her salad had these ingredients, apples, beets, and pears. Mine just has apples and beets. My kids don’t like the pears available here, they say they feel too bumpy, and sometimes they can’t seem to swallow them. Don’t ask me why. 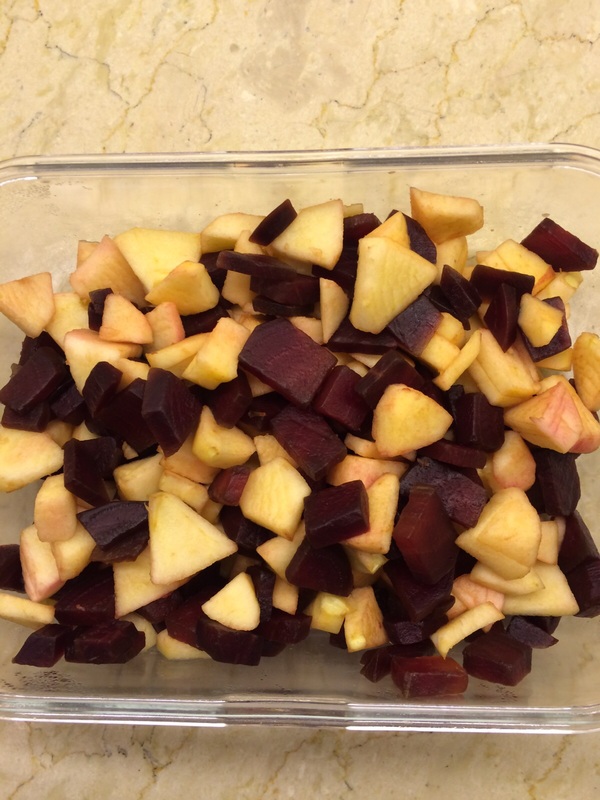 In this salad, I used 2 beets, and about 3 apples since apples these days are a bit small. 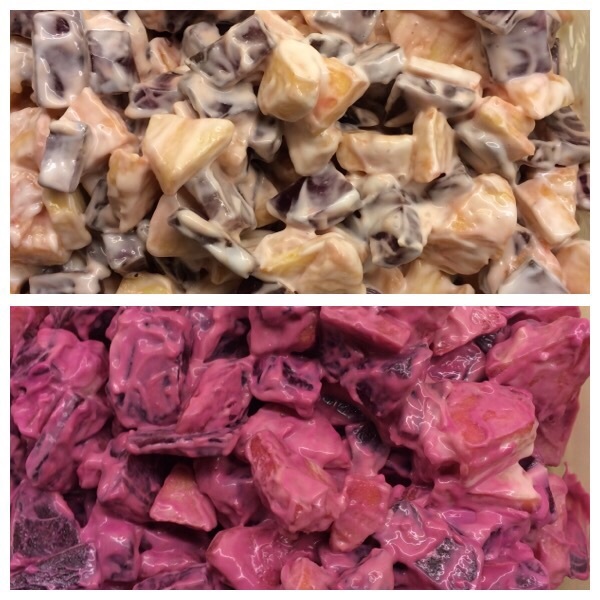 After peeling the beets, I diced them up as I would when making fruit chat. I peeled and diced the apples as well. Boil the beets until tender. Just make sure they are boiled through. 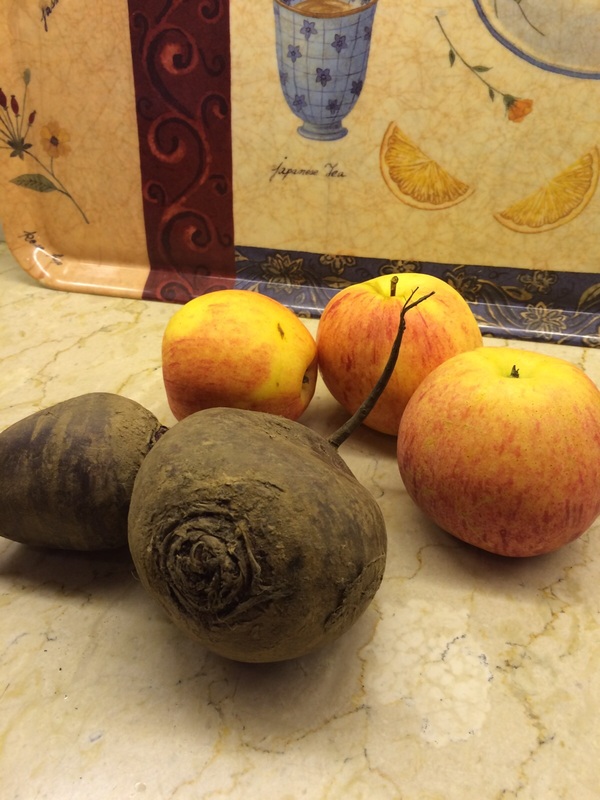 Let the beets cool down and then mix with the apples in a container. 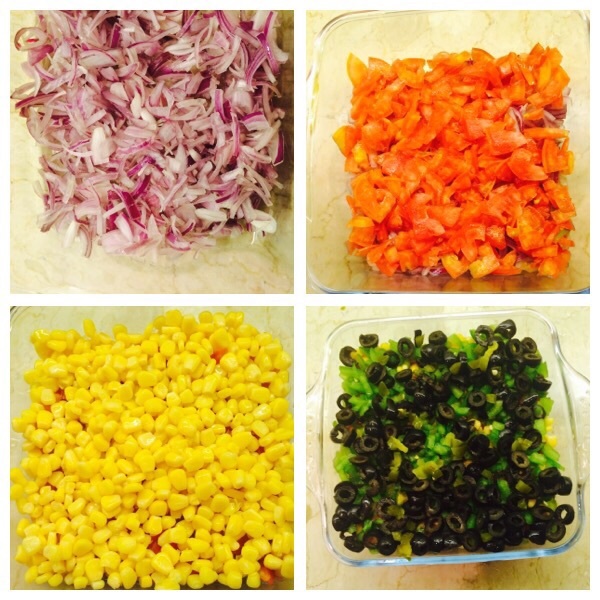 Now, on to the dressing…. When I asked my mom how she made this salad, she just told me the things she added and no quantity. I like to know the quantity and my mom would just say, “mera andaza hai,” (It’s according to your taste) which didn’t help me much. She tried her best to tell me how much, and the rest was up to me. So trial and error many times this summer and I found a balance I liked. The funny part is, I didn’t use measurements either! So let’s see if I can explain it well enough for you to try this as well. The dressing consists of yoghurt (I used Nestle and not homemade because this is a sweet/tangy salad), mayonnaise, vinegar, salt and sugar (I use castor sugar because it dissolves quicker). Now, in my head, I feel using a bit more yoghurt than mayonnaise is a healthy decision. So I use more of yoghurt and mix it well with some mayonnaise, then I would use a cap half way full of vinegar and a bit pinch of salt, and 2 big pinches of sugar. Does this make sense? Well, today, I measured the ingredients and well, it didn’t come out the way I want it. I think it needs a bit more vinegar. But since I already have mixed it for you all to see, I’ll just eat it the way it is. It’s still tasty! So I measured it this way: ½ cup yoghurt, 1/3 cup mayonnaise, ¼ tsp salt, 2 tsp sugar, and 1 tsp vinegar. There is something wrong with this, it isn’t tangy enough, so yes, I need to add a bit more vinegar, and I might have added a bit more sugar than I stated, and not enough salt. You guys can figure it out. Sorry ladies, I’ll try better next time, inshallah. Mix both dry and wet ingredients and refrigerate. After a few hours, it will turn a nice shade of purple. Serve chilled as a side dish or your main course. And it tastes better the next day. Be careful though as beets to stain clothes! I think one day I will try it when I attempt to dye things using natural household items. Lol! Salads are quite refreshing. Some with a light vinaigrette, and some with a creamy dressing. I love the crunch sound in my mouth because of the juicy, crunchy lettuce and bell peppers, and the juicy tomatoes. I love to add some fried cottage cheese to my salads sometimes too. Though I’m not sure what the health ratio is in that particular salad. Last summer, my sister was visiting, and she made this particular salad at my parents’ place several times. And each time, I was not there! But, this year, my sister in law made this salad for us one day when I was visiting. She kept going on and on about how amazing it was and so forth. I didn’t really believe her. LOL! Since we were all preparing for the lunch, she asked me to cut the vegetables. I tried my best but she did go back and recut some of the things. She explained to me that she wanted the vegetables cut in a certain way so one could get everything on the fork. It didn’t really make that much sense to me because to my knowledge, I was cutting the stuff small and thin. 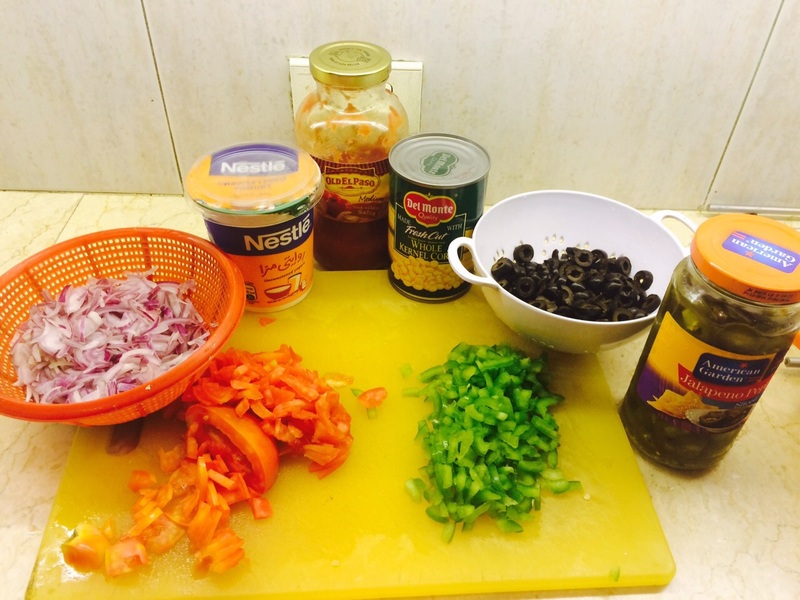 Anyway, we set out every vegetable we needed, sliced onions, tomatoes, bell peppers, corn, black olives, and jalapeños. Since she had made this several times, she knew that the onions needed to be rubbed with salt and then washed well. They also needed to be drained well, and the dried in a towel (reasons I’ll share later). The olives, corn and jalapeños also needed to be properly drained. 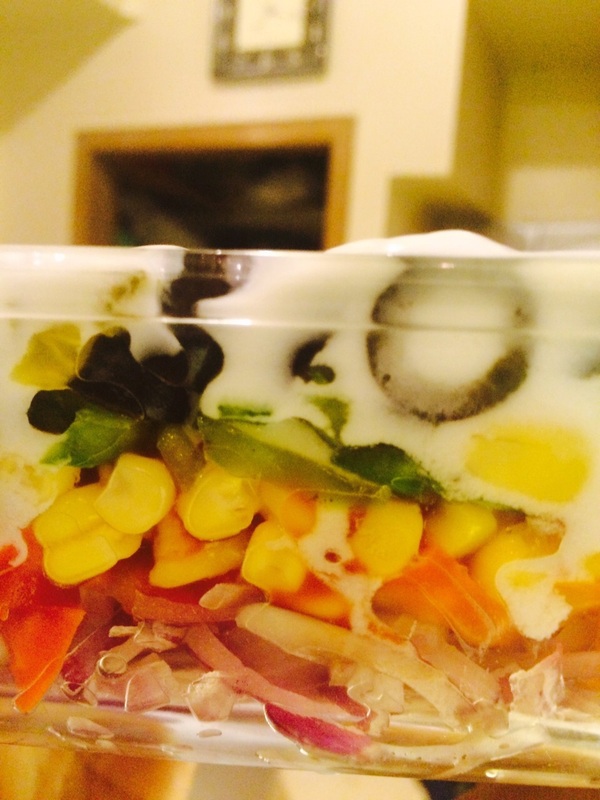 After about 20 minutes, she started layering the salad. It’s best to make this in a glass dish so one can see all the pretty colors of the vegetables. Set in fridge for an hour and it’s amazing. You’ll see. So there are a few things I noticed and wanted to share with you all. Vegetables should be properly washed, drained and cut into small pieces. Our onions were quite strong, so we cut ours in thin bit size strips and rubbed with salt. We washed them well, and after draining them for about ½ hour, we then proceeded to dry them in a towel. Because onions have water, it will actually make the salad liquid-y, and that isn’t nice. (I once forgot to dry them in a tea towel and low and behold, after a couple of hours, the yoghurt and water from the onions had made a layer at the bottom). All of the vegetables were sliced into bit size pieces. We used sliced olives to cut our time short. And I only used a few jalapeños, which I chopped into very small pieces. I felt a layer of these would be too spicy for my kids. I also used a medium flavored salsa, which is the imported kind because that is what I like. Also, we used the Nestle orange container yoghurt because it’s not sweet. My sister in law likes to use the juice of the jalapeños in most of the layers to make it tangy. She just uses a few drops. The actual recipe has mashed refried beans, avocado and sour cream. It’s actually a dipping sauce. They use cheese and some even bake theirs to make it into a salsa dip. It looks amazing on Pinterest. But alas, we don’t have all the ingredients available here, though this version is equally good. I made it the other day and it was even amazing with my daal chawal. My kids had it with their chicken tenders and rice. It makes for a nice side dish, and even a main dish as well. It’s cold, refreshing and healthy! What more could a gal want! So please try it and enjoy. I hope you all find it equally satisfying. P.S., in my pictures, you will notice that my layers of bell pepper and olives aren’t fully covering the dish, I actually ran out. It is best if each layer is properly filled.